■ Firefighters and Army Bomb Disposal team at the house fire last Saturday. THE CAUSE of a blaze that damaged a Victorian house in Castlebellingham last weekend will not be known for several days as Gardai and ballistics experts continue their examination of the scene. 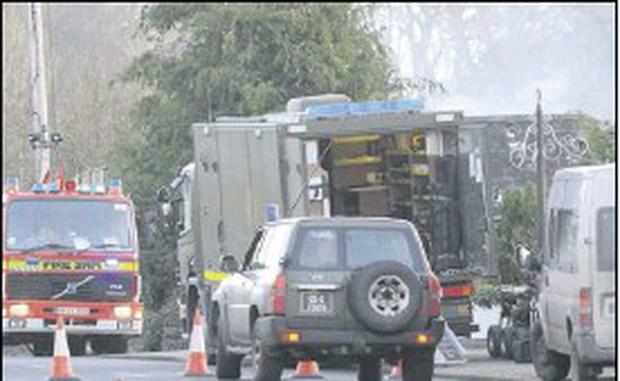 The Army bomb disposal unit, dozens of fire fighters, and emergency service vehicles attended a large fire at Castle Cosy, Castlebellingham last Saturday after it was discovered that military memorabillia, including antique grenades, were in the house. Two people were taken from the blaze at the sprawling building, suffering from smoke inhalation. The site has been preserved and is currently being examined by Garda experts, including scenes of crime officers and ballistics experts based at Garda HQ and it is expected to last a number of days. The fire was discovered at 12.30am on Saturday by two people who returned to the house, which is owned by James Shortt, a collector of antique and other military-related items. The two tried unsuccessfully to extinguish the flames, according to Ardee superintendent, Ray Brennan and the emergency services were called to the scene. As well as four fire tenders from Dundalk and Dunleer which attended the fire, the Army Bomb Disposal Unit was also called to the village to examine a device which was found inside Castle Cosy, which is a large red-bricked house down a narrow laneway. According to Superintendent Brennan, tests carried out by the Bomb Disposal Squad, showed that this was not a viable device. The two people in the house were taken by ambulance to Our Lady of Lourdes Hospital suffering from smoke inhalation, but were released shortly afterwards, according to the emergency services. The owner of the house, James Shortt is currently out of the country but he is expected back in Ireland in the near future. Ardee Gardai who are investigating the circumstances surrounding the fire have appealed to anyone who was in the Castlebellingham area between 10.30pm and 12.30 am on Saturday who may have any information to contact them at 041 685 3222.